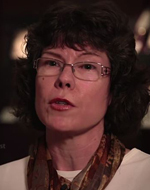 Dr Rosalind Grooms, Cambridge University Press Archivist, explores how the First World War impacted upon our printing, publishing and employees. Archives are surprising. They challenge assumptions, reveal hidden insights and shed a sideways light on history. Searching for an understanding of the Press and the First World War, I went straight to the large bound volumes of Syndicate Minutes held in the Press Archive at Cambridge University Library. Expecting to find a solemn announcement recording the outbreak of hostilities, it was the index entry which caught my eye: War, the. Stark, practical, a guide to relevant pages, a top-level term for sub-headings below. War. The one everybody knew about. It would be ‘First’ when there was a second, ‘World’ when the Americans and countries of the British Empire joined, and ‘Great’ when 16 million were dead. The resonance of this index point created in 1914 lies in the knowledge that there was so much to come, so many future page numbers to record under its echoing heading. Expecting to find a solemn announcement recording the outbreak of hostilities, it was the index entry which caught my eye: War, the. It also dawned on me that this European emergency took place during the University Long Vacation. There would be no place for an eloquent expression of regret in Minutes created months after War was declared. The last Syndicate Meeting of the Easter Term was held on 24th July, the next on 16th October. When Term resumed, there were publication matters requiring attention and business decisions to be made. The Press did the decent thing, quietly. This was the National Relief Fund, established on 7th August 1914, and again it is the detail which reveals great insight. 250 guineas? Today’s equivalent sum is approximately £26,000. Syndicate Minutes detailing the 250 guineas being sent to The Prince of Wales’ Fund. Original held at Cambridge University Library. What should the Press do in wartime? It should print and publish. Authors needed their research distributed and to receive consequent royalties, people needed their jobs, a sustainable business must be maintained for staff returning to civilian life from Active Service … and it needed to employ women. Miss Noble, Miss Bennett and Mrs Atkins brought change to the Counting House and Purchase Accounts Department and, as C.J. Round recalled ‘The majority of the women employed by the firm proved extremely satisfactory and just as efficient s the men they replaced; with their help the business bravely carried on. Some of us may have thought we were indispensible, but we learnt otherwise.’ (Round and about the London Publishing Office of the Cambridge University Press 1902-1953 by C.J. Round, p.16. UA Pr.V.51). The few female employees had previously been ‘typist-secretaries’ or they worked in the ‘Bible Department receiving room’. Now they took senior positions of responsibility. It was the enterprising and compassionate Miss Beament who ‘collected a subscription of a few pence a week’ to send Press soldiers ‘frequent very welcome gifts of cigarettes and books’ (p.19). The University extended hospitality to Belgian scholars at Louvain University displaced by the War and the Press temporarily took over publication of Le Muséon, a quarterly review of Oriental Studies normally published at Louvain (The Historical Register of the University of Cambridge Supplement 1911-20. Cambridge 1922, p.204). 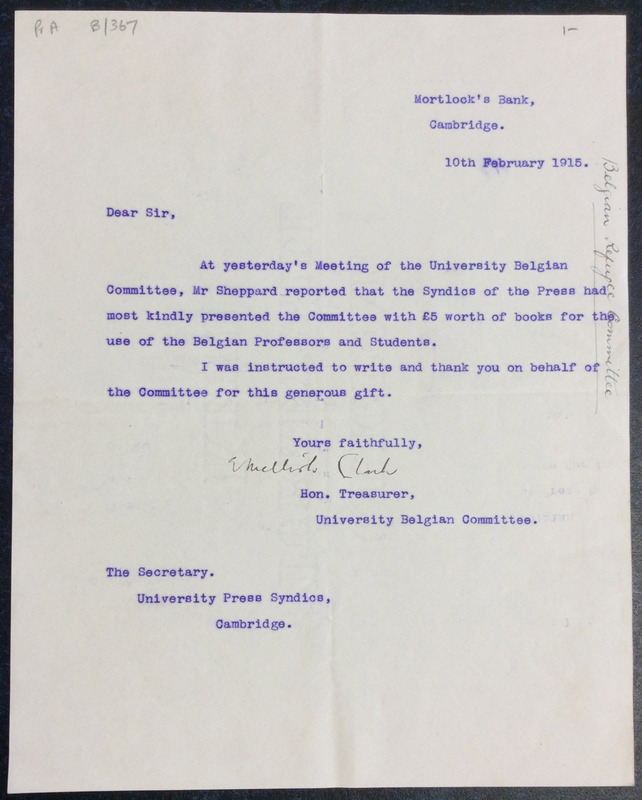 On 10th February 1915, the Honorary Treasurer of the Belgian Refugee Committee in the University sent a letter of thanks for ‘£5 worth of books for the use of the Belgian Professors and Students’ (UA Pr.A.B.367). 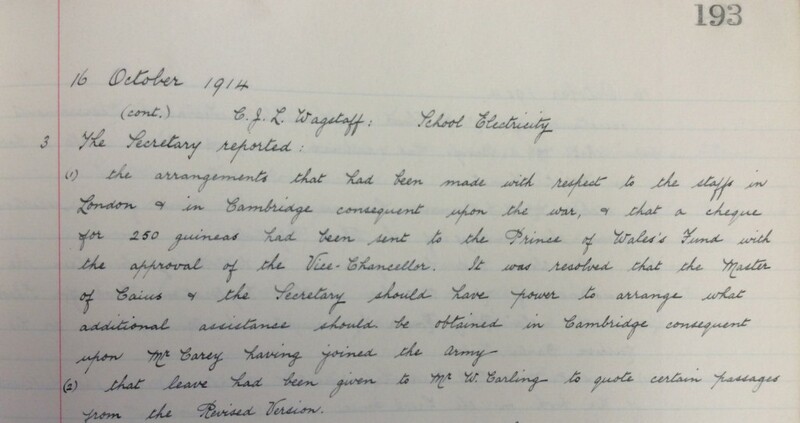 Letter dated 10th February 1915, from the Hon. Treasurer, University Belgian Committee. Original held at Cambridge University Library. 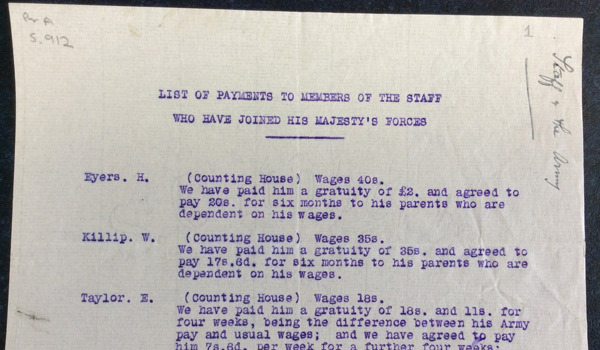 List of payments to members of the staff who have joined His Majesty’s Forces, including Eyers and Killip. Original held at Cambridge University Library. The index entry gives pause for thought and the financial transactions reveal practical kindness. The Press Archive commemorates Press men who gave their lives, Press women who changed its working environment, and its concern for refugees with a need to learn. Public tribute was paid later. In 1920, a memorial service and dinner were held by the Syndics and the War record of the Cambridge University Press, 1914-1919 (Cambridge 1920) was published. A list of names engraved on a wooden panel was placed in a side-chapel of Saint Botolph’s Church, a few steps away from the Pitt Building on Trumpington Street in Cambridge. 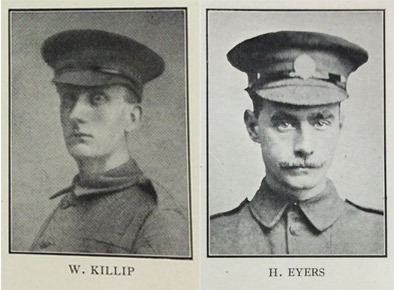 William Killip and Harold Eyers – two of the forty-one brave employees who lost their lives in The First World War. Reproduced by kind permission of the Syndics of Cambridge University Library. It is in the Press Archive, for those who open the pages, that private evidence is found of the Press supporting its people and its country in the War … War, the.